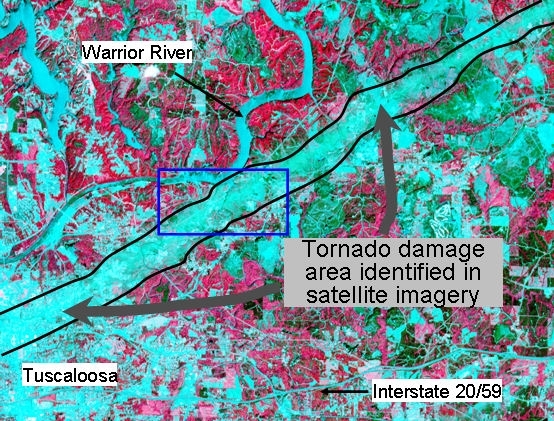 NASA has released a unique satellite image tracing the damage of a monster EF-4 tornado that tore through Tuscaloosa, Alabama, on April 27th. It combines visible and infrared data to reveal damage unseen in conventional photographs. “This is the first time we’ve used the ASTER instrument to track the wake of a super-outbreak of tornadoes,” says NASA meteorologist Gary Jedlovec of the Marshall Space Flight Center in Huntsville, AL. For more information and additional images, read the full article.